Ultimately the Avengers were able to take Vision down and detain him. Upon reawakening, Vision tells the Avengers Ultron created him solely to kill them. 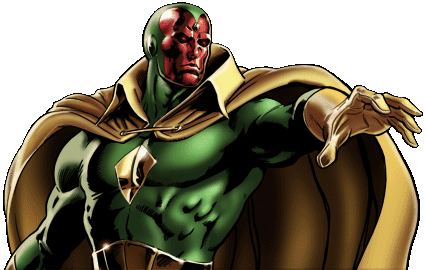 After learning of the Avengers plight, Vision betrays the programming Ultron put in place and joins the Avengers in fighting Ultron. Vision is a robotic equivalent to the human body in that he possesses all the organs of a human but stronger in durability. Given that he is a robotic entity, Vision can access computer systems wirelessly and with ease. All of his senses are tuned to perfection and he has the accompanying super strength and speed. He also has the unique ability to manipulate his density as to allow his body to pass through barriers without hinderance. 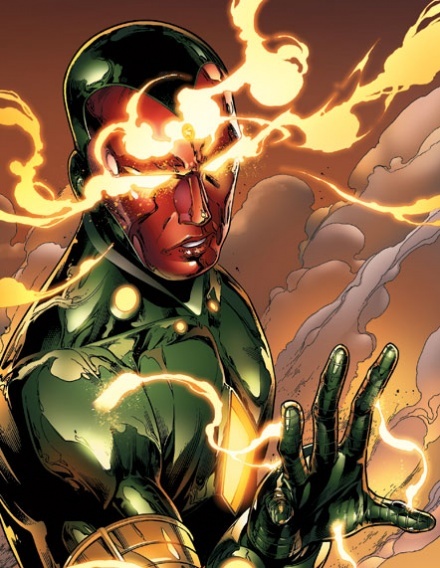 Vision also has the ability to absorb solar radiation with the crystal on his forehead. He uses this not only as a power source but also as a channel to project concentrated solar energy beams. One of Vision’s only weaknesses is his strive to be more human. This Pinocchio like theme is only too perfectly in sync with the choice of ambience in the original trailer. The contrast between Ultron, who is moving farther from humanity, and Vision who is asymptotically approaching humanity, will play a huge role in the newest Avengers movie. As far as the new movie is concerned, they are shifting the creator of Ultron from Hank Pym to Tony Stark. They are also shifting the creation of Vision from Ultron to a collaboration between Banner and Stark. Paul Bethany is playing Vision, who up until this point has been JARVIS; and contrary to comic book cannon is essentially JARVIS placed in a living body to help the Avengers fight Ultron. We have not seen a whole lot of Vision in the trailers. To be honest this makes plenty of sense because from what I can tell the second Vision goes live, the game changes and the Avengers have the upper hand on Ultron. The reason we have seen so little is because every scene Vision will be in, is going to be so key to the climax of the film, that none of it should be spoiled via trailers. The only shot we have of him in action is the epic finale to the final trailer where it shows him starting up and opening his eyes. This final scene amplifies the hype for this film and I for one think May 1st can not come fast enough. As a side note, I would like to point out the level of integration and foresight for these films is outstanding. As far back as Captain America: The First Avenger there is an egg for the Human Torch android. I commend this team who has clearly thought these things out incredibly well.